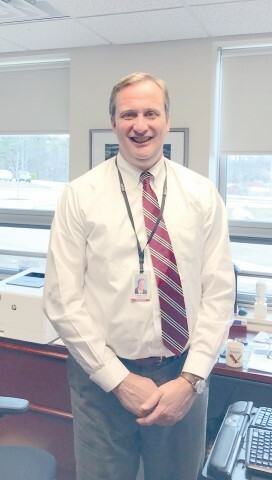 Windham High School (WHS) principal, Chris Howell, has worked in the district for over twenty years. He has decided to leave his role as high school principal at the end of this school year to work at the superintendent’s office as the assistant to Superintendent, Sanford Prince. John Davis, the current superintendent’s assistant is retiring. Howell’s journey into education was a long and winding road. While playing soccer his freshman year at the University of Southern Maine, a shoulder injury prematurely ended his soccer career. Howell decided to investigate teaching after taking a coaching position at Falmouth Middle School his freshman year of college. He received an undergraduate degree in Biology and obtained his master’s in teaching and learning from the University of New England. Howell started at WHS as a life science/physical science teacher in 1996, eventually teaching biology and earth science. In 1999, he became assistant principal of the Windham Middle School and four years later, in 2004, he left to join the central office as Director of Curriculum Instruction. He became principal at the high school in 2011 after the previous principal, Deborah McAfee, decided to step down as principal. Howell loves being able to watch the kids progress and grow from when they arrive as freshman to when they graduate. He enjoys being involved with student activities as well as working with a staff that have students at the heart of their mission. Howell’s ultimate goal is to become a superintendent and feels his background and experience will one day make him right for the job. “The more you understand all the little moving pieces of a school as a large entity, the better leader you are,” Howell said. “I am interested in working with educators at all age levels to plan systems of instruction for students and I enjoy the policy process and working with the public in shaping our schools. I believe the role of administrators is to remove barriers for our teachers and to advocate for our students. As superintendent, I would be able to do this for an entire district,” Howell explained. A resident of Cumberland, he’s married with three sons. During his down time he works with fireworks professionally in the summer, loves going to his camp in Vassalboro and enjoys spending time with his family.